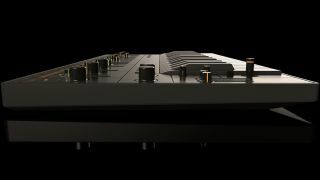 Superbooth 2019: Superlative Instruments has teased some details of a new synth that will be fully revealed at the Berlin show in a few weeks. It seems that Behringer isn’t the only company having a go at recreating the classic Roland SH-101 monophonic bass synth. The SB-1/Space Bee looks like a clone, but with plenty of new features to set it apart from the crowd. Most notably is a rechargeable battery and unique keyboard. Of course, portability isn’t anything new, with the original being propped up by six C-type batteries. However, times have changed and we’re probably looking at some kind of slim, lithium-ion type of battery pack, with all day playability promised. The keyboard, we’re told, is “a newly-developed full-size keyboard based on tactile rubber dome switches for a fast and responsive feel.” How that feels to play will be tested at the show itself. The sequencer is dual-layer and also features synchronised control of a second instrument via CV/gate or MIDI. Although there no details on the full feature set at the moment. Judging by the images the SB-1/Space Bee looks quite slim and possibly light, but we’re detecting a distinct lack of strap buttons and there’s no mention of a modulation grip- type appendage. We’ll bring you more details from the show. In the meantime, you can find more info on the Superlative Instruments website.